Tough enough to take on the jobsite with the versatility to handle all your outdoor adventures—that's the T-Rac T-Rac Pro2 Truck Bed Rack. On the weekdays, use it to haul your ladders and lumber. Come Saturday, take a trip down to the lake with your canoe or kayak. With the TracRac Pro2 T-Rac, you just pick the payload and pile it on. In the past, installing a universal truck rack meant toiling away all afternoon drilling, cutting and welding a soon-to-rust steel cage into your bed. Now, with the TracRac TracOne Truck Bed Rack, about an hour is all you need—barely enough time to finish one frosty brew. Your TracOne comes with Single Axis Clamps—an ingenious no-drill mounting system that clamps to your bed rails rather than bolting through them. Dress-up your truck while adding function with a set of cab length nerf bars from TrailFX. Constructed of durable, 4.5" steel tubing, each bar is black powdercoated for a superior finish that resists rusting, chipping, or peeling. Ensuring sure footing in any weather condition, the TrailFX nerf bars feature ABS composite step pads that allow easy entry and exit. TrailFX nerf bars also feature fully welded ends. No more plastic to break or loosen, and they look great! Sold in pairs, nerf bars come complete with all necessary installation hardware. Dress-up your truck while adding function with a set of cab length nerf bars from TrailFX. Constructed of durable, 4.5" 304 stainless steel tubing, each bar is polished for a superior finish that resists rusting, chipping, or peeling. Looking for a quality aluminum tool box that break you budget? Need a box for specific model, or one for special configuration? TrailFX offers a wide selection of sizes and styles to suit just about everyone. Long loads are easily secured and safer to haul ABOVE or BEHIND the vehicle. Installs in seconds with adjustable height for roof top hauling or bed extension. 4’ wide support, stores flat behind the seat, red flag included. The TrailFX 3" nerf bars are truly a step up from your average pair of tube steps. They give you a solid, corrosion resistant construction. Made from T304 marine grade stainless steel tubing, they're truly built to last. Looking for a great way to get your truck noticed? Try a set of our Black Powder Coated 3" nerf bars guaranteed to last. Makes getting in and out of your truck twice as easy and gives it the look of a truly different truck! Featuring a 4.5" wide step for maximum grip and are fully welded on the ends. No plastic to break or loosen! Trail FX Oval Step Bars are available in Polished stainless steel or Black powder-coated finish. Custom designed and engineered for every application. This 3” bull bar adds style, with added protection for full size trucks, SUVs, and CUVs. Each application is designed for maximum ground clearance with easy no-drill installation. designed for maximum ground clearance with easy no drill installation. is for work or play, TrailFX has something for everyone's needs. A vehicle equipped with a grille guard is definitely an eye catcher. Such grille guard is among the first things that will always be noticed by onlookers. TrailFX aluminum tool boxes offer the widest selection of sizes and styles in the industry. These superior quality boxes are packed with features, yet affordably priced to fit your budget. The 3” Stainless Steel Side Bars are made of T304 marine-grade stainless steel tubing and include ABS injection-molded plastic step plates and powder-coated vehicle-specific mounting brackets for ease of installation. They are available for most popular trucks, SUVs, and CUVs. Looking for a great way to get your truck noticed? Try our Stainless Steel 3" nerf bars gurrenteed to last. Makes getting in and out of your truck twice as easy and gives it the look of a truly different truck! 5" Black Powder Coat Oval Bent End Side Steps by TrailFX. Rocker Panel Mount. This product is made of high-quality materials to serve you for years to come. Nyracord™ Black Bed Mat (631D) by TrailFX®. Without Raised Edges. Tailgate Mat Not Included. TrailFX bed mats are custom designed to fit a variety of trucks to include Ford, Chevy/GMC, Dodge, Toyota and Nissan. 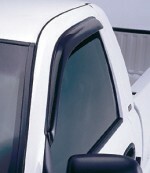 Universal applications and tailgate protectors are also available. Protect your investment with a TrailFX Bed Mat and Tailgate Mats. This product is made of high-quality materials to serve you for years to come. Designed using state-of-the-art technology and with customers in mind, this product by TrailFX will last a lifetime. It will meet your needs and deliver great quality at an affordable cost.